Okay, let's get this out of the way. Periods. No girls like periods. Whatever the tampon adverts try to tell us, nothing about them is glamorous, we will probably not fancy going on a bike ride or climbing a mountain like they say, and it probably the worst week of each of our months. That being said, it gives us an excuse to eat comfort food (Dominos on speed dial) and pamper ourselves a little more than usual, then blame it on that time of the month. 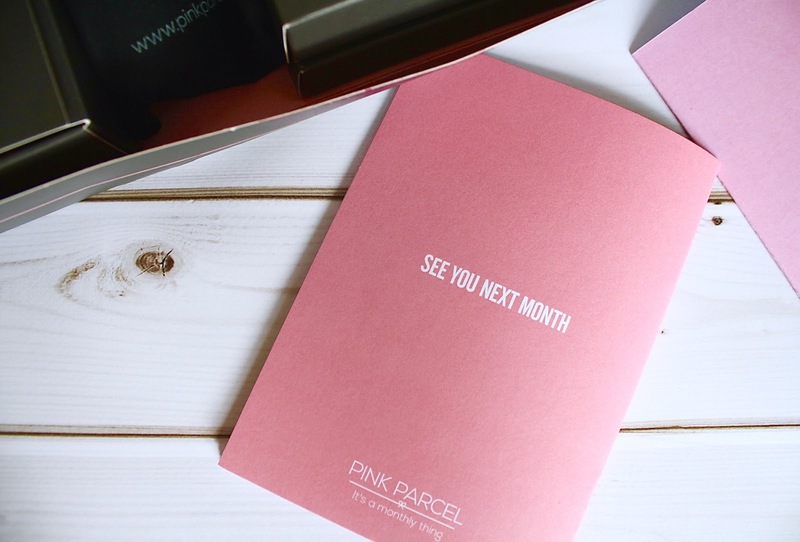 I have, however, found one other reason to enjoy that one week a little more; Pink Parcel is a monthly subscription box which is tailored to suit your needs. A box consisting of food to comfort-eat, products to treat yourself to and of course, the sanitary bits and pieces that we all need, delivered to your doorstep just in time on a monthly basis. 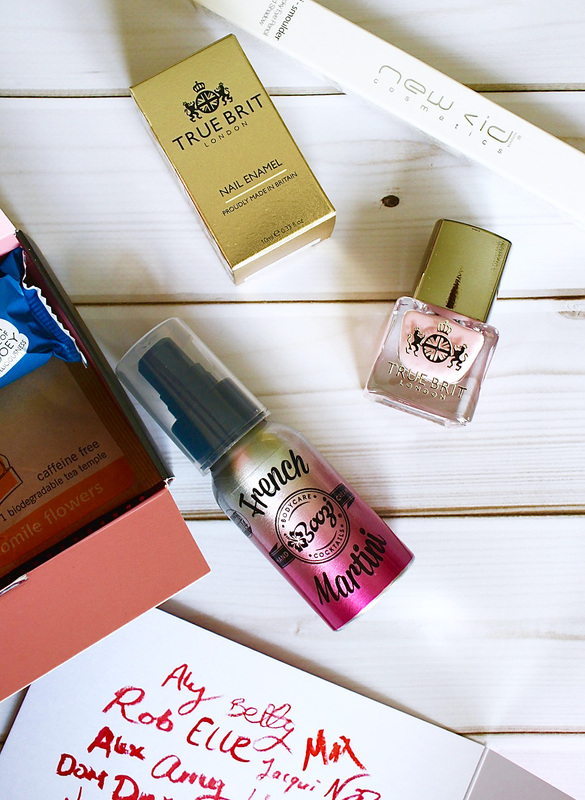 I was recently contacted by the lovely team and they kindly gave me the opportunity to test out their April subscription box*. The box itself is broken down into sections; my box consisted of a 'For You' section with sweet treats and beauty products to make me feel a little better plus 'For Now' and 'For Later' sections with sanitary towels and tampons. 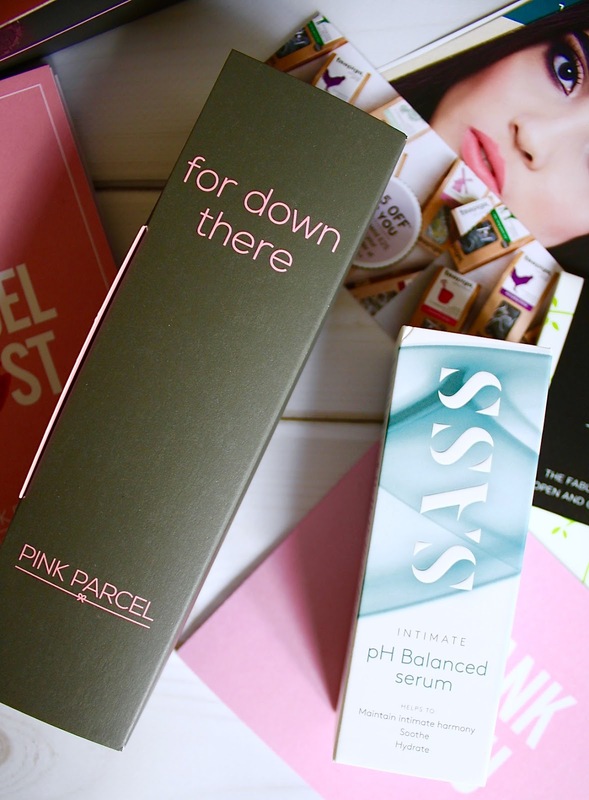 It also included a 'For Down There' box with a SASS pH Balanced Serum which is designed to restore your body's natural pH levels, soothe and moisturise. 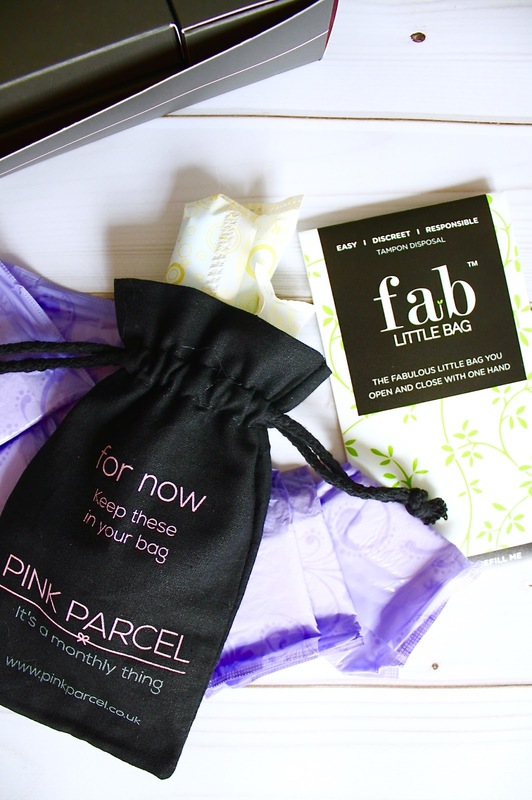 Along with this, the April box contained a discreet tampon disposal bag by the brand, 'Fab Little Bag'. 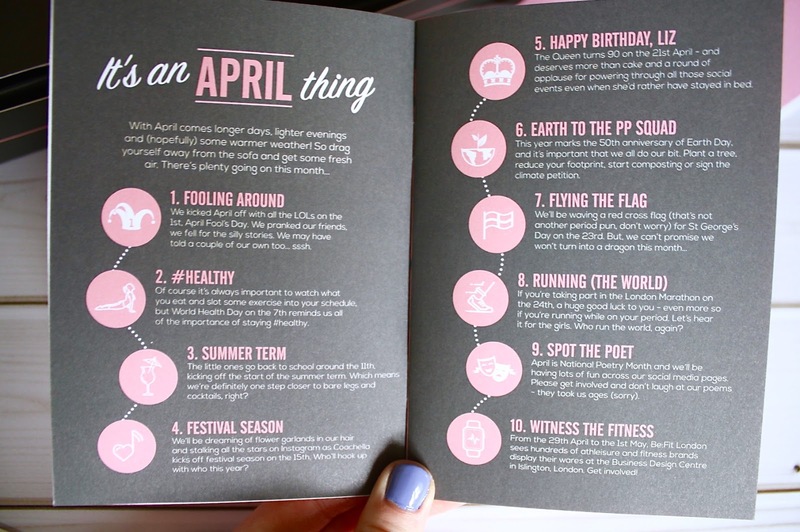 In the box, I received a mini booklet that goes into more detail about each of the brands/products included; I loved the April summary page, giving you a rundown of reasons to look forward to the month ahead (Happy 90th Birthday Our Majesty!). 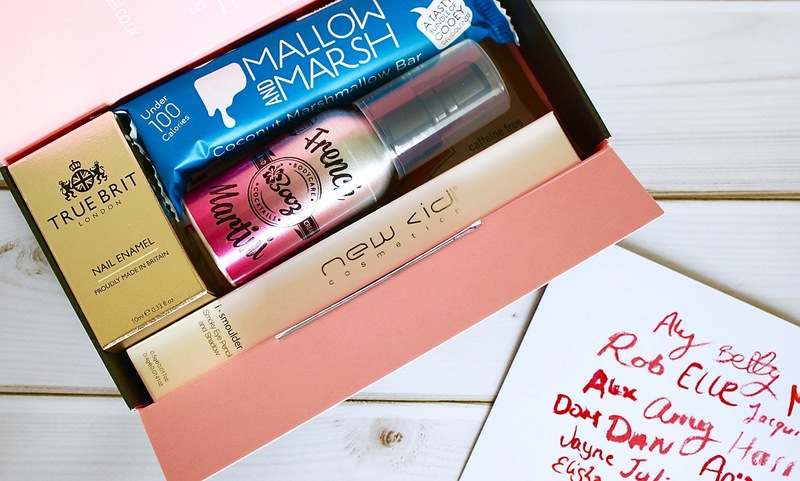 Many of the brands that are featured in the box also kindly offer discount codes to be used on their sites for future purchases, including 20% off Mallow And Marsh, 15% off Boozi Body Care and New CID Cosmetics, and £15.00 off when spending £25.00 or more on the Tea Pigs website. 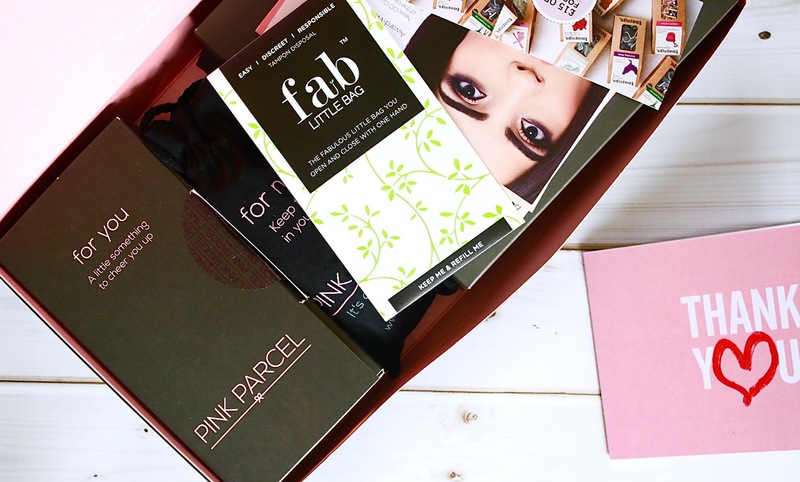 I really do love the concept behind the Pink Parcel subscription boxes; I think the price point is just right and you receive such a good selection of products each month. On subscription, the first box is only £9.95 as an introductory offer and thereafter, the following boxes are £12.99, which includes P&P. Pink Parcel takes the chore out buying sanitary items and adds a little excitement as you will also be receiving sweet treats to help with the notorious PMS cravings and items to pamper yourself and make you feel a little better throughout that dreaded week. The products I received in this box, without including the sanitary items and foodie treats exceeded a total of £36.00, over 4 times the value of the whole box itself. I think that just about says everything when it comes to whether or not the box is value for money. 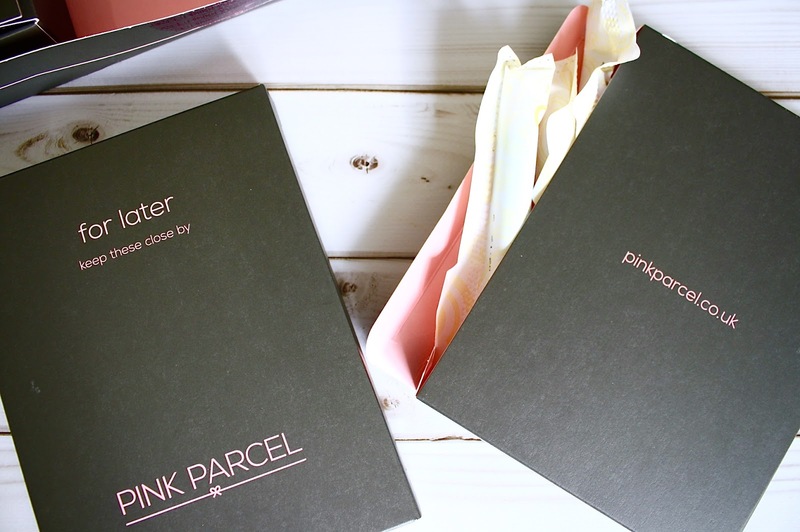 If you're in the market for a new subscription box to try, something a little different than the usual makeup boxes that are currently out there, I would whole-heartedly recommend Pink Parcel. The team there are amazing, particularly Elle who kindly helped me to organise my box, and you really get a feel for the teams' passion for the brand too. Now, where's that Chamomile tea? As much as a unspoke subject it is, I think this is perfect. I think the government should hand these out for free! The idea of everything you need - the right amount of products and your favourite brands. Possibly the best box idea out there! I think when I've used up the stash of products i have, I will give this one a go as it looks like it would make that awful time of hte month just that bit more manageable! Plus tampons and pads can add up and be quite expensive sometimes so atleast you're paying for them and extras! What a lovely parcel !